On 14 September 2013, 65 years to the day since Fulbright New Zealand was founded by the signing of a bilateral treaty, 120 guests were hosted for a gala dinner by the Governor-General of New Zealand, Lieutenant General The Right Honourable Sir Jerry Mateparae and his wife Lady Janine Mateparae, at their residence Government House in Wellington. 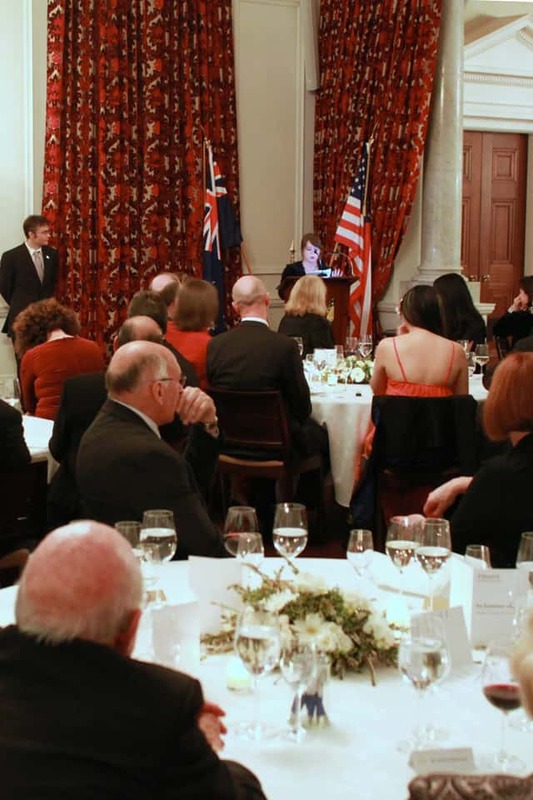 US Ambassador David Huebner and New Zealand’s Minister of Education, Hon Hekia Parata, spoke as representatives of the two partner governments in New Zealand’s Fulbright programme. Alumni and grantees were showcased, with speeches by current US graduate student Andrew Cole and recent New Zealand alumna Nicola Kean. Alumna Marisa Maepu read from the novel written on her exchange and alumni Susana Lei’ataua and Gareth Farr gave a musical performance. Toasts were made to the President of the United States of America and the Queen of New Zealand, and two artworks by current grantee Janna van Hasselt and alumnus Darcy Nicholas were sold by silent auction. E ngā reo, e ngā mana, e ngā iwi o ngā hau e whā, tēnā koutou, tēnā koutou, tēnā koutou katoa. Nau mai, haere mai rā ki Te Whare Kāwana o Te Whanganui-a-Tara. 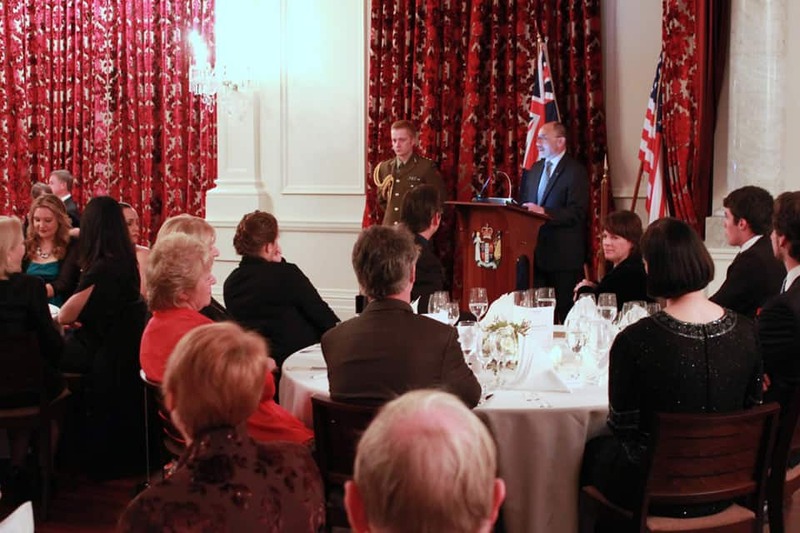 Distinguished guests, ladies and gentlemen, greetings to you all, and welcome to Government House Wellington. 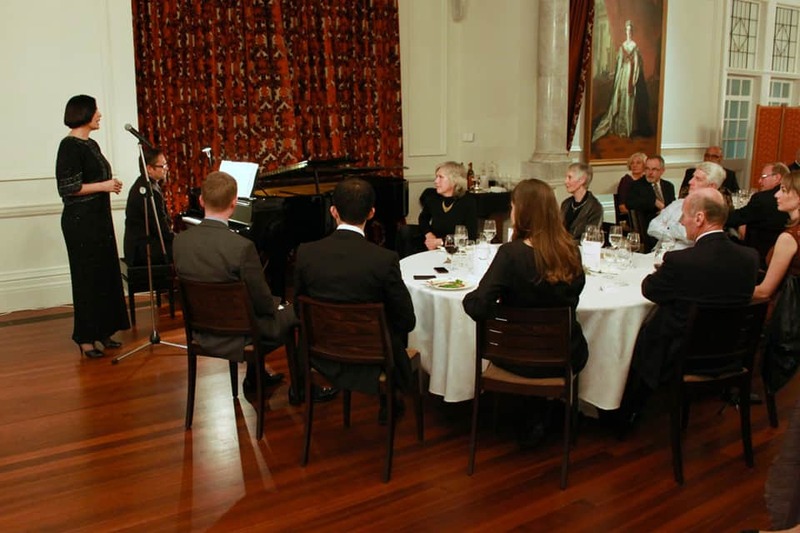 I specifically acknowledge: Hon Hekia Parata, Minister of Education; Your Excellency David Huebner, Ambassador of the United States and Honorary Chairperson of Fulbright New Zealand; and Dr Helen Anderson and Mele Wendt, Chair of the Board and Chief Executive of Fulbright New Zealand respectively – tēnā koutou katoa. It’s a great pleasure for Janine and me to welcome you all to Government House this evening to celebrate the 65th anniversary of Fulbright New Zealand. Tonight, we are celebrating a successful enterprise and successful people. The list of Fulbright alumni from this country is long and illustrious. It includes a Prime Minister, Members of Parliament, judges, diplomats, Nobel Prize winning scientists as well as dancers, historians, composers, teachers and many more. Some are household names, clearly some are not. Yet they are all renowned in their fields of expertise. All of them can be said to be among our best and brightest. We are blessed to be able to live in this beautiful country, and in this part of the world. There is a price to pay in living geographically isolated. No doubts that our apartness has paid dividends in terms of our independent spirit, our inquisitiveness and an innovative can-do-number-8-wire mentality. Isolation also constrains capability, capacity and character. The shift in global awareness, and our sense of place and opportunity was discernible in the aftermath of the Second World War. That World War, and especially the war in the Pacific, caused us to re-evaluate our priorities and introduced us to Americans. Senator J. William Fulbright’s mission to use educational exchange to increase mutual understanding came at the right time for a country that was becoming more confident in its own identity and seeking to carve out its own niche on the world stage. It is no surprise then that New Zealand became one of the first Fulbright partners, and the fifth country to join the programme in 1948. It is from this lofty aspiration that being awarded a Fulbright scholarship is a singular honour. I was struck by how many Fulbright scholars said their experience was a highlight of their professional and personal lives. Being a Fulbrighter opened doorways to other fields of achievement or sent their research in new and exciting directions. I imagine that Fulbright would have also anticipated that his programme would provide scholars the opportunity to have an adventure, have some fun and to make lifelong friends. Reading some of the recollections of earlier scholars attests to that. In a world where the war had curtailed international travel, and long before daily long-haul flights, the trip to the United States was more like an epic journey. Fulbright New Zealand graduate student Michael Martin-Smith’s 1951 trip, for example, involved sailing by ship to Panama, catching a plane to Miami then taking a Greyhound bus to Washington DC. Travel for today’s Fulbrighters is much quicker and easier, although I’m sure the risk of losing luggage remains the same! 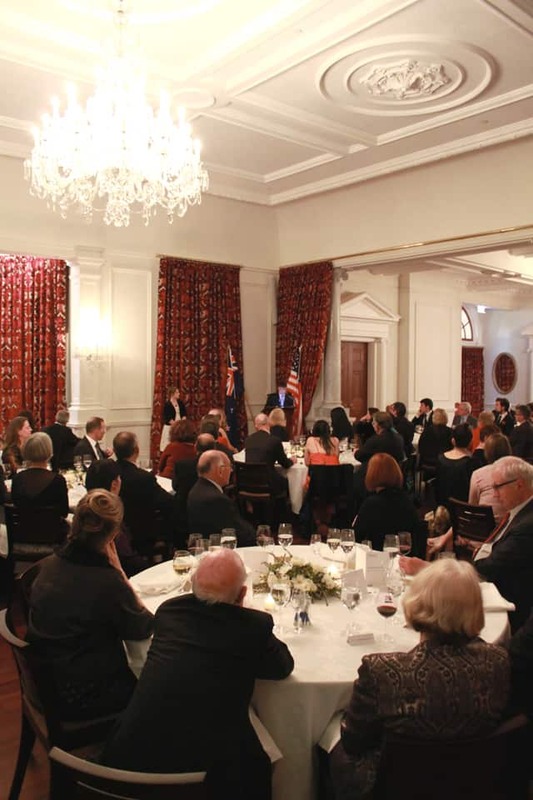 Since those daring early days more than 1,700 New Zealanders have been given the opportunity to study at some of the world’s best educational institutions and in return we have hosted more than 1,350 Americans. It is evident that scholars both ways develop a deep and abiding affection for their host country. American Fulbright alumni and their inclination to be unofficial ambassadors for New Zealand is evident in their cheerleading as demand in the US for places in New Zealand far exceeds supply. Senator Fulbright’s vision of using intellectual exchange for the betterment of society continues to do what he had hoped it would – foster leadership, learning and empathy between cultures. I congratulate Fulbright New Zealand for 65 years of service and commend all Fulbright recipients for their achievements and contributions. Congratulations on your 65 years of encouraging and facilitating education, excellence and reason. I’d like to begin by thanking Fulbright for the opportunity to come to New Zealand. I’d also like to thank the United States and New Zealand governments and all of the individuals, alumni, and organisations who through their generous donations have made awards like mine possible. This has been a wonderful opportunity for me, and I hope that you will continue to support the program so that more students have chance to grow personally and professionally like I have here. I’ve had an absolutely fantastic time exploring New Zealand so far. I’ve traveled extensively and visited national and forest parks like Fiordland and the Tararuas, and towns and cities such as Wanaka and Rotorua. In each case my experience has been incredible. I’ve traveled for both enjoyment and for my project, which involves recording the sounds of the bush and using those sounds as musical objects and inspiration. So far I’ve recorded many wonderful bird calls and sonic landscapes. Unique sounds I’ve recorded include the beautiful calls of bell birds, the gentle murmuring of the takahē, and the wind blowing through flax. I have relished this diverse and new sound world, and incorporated these sounds into my music. Traveling to remote areas to record has been extremely memorable, but even my every day experiences have been amazing. Living in Aro Valley and hiking in the Pollhill reserve I often hear the complicated calls of tui and quirky screeches of kākā. I wake up every day to the awe-inspiring chaos of the dawn chorus. My time here has been extremely fruitful musically, pushing me to grow as a composer. The varied approaches of combining the arts and nature that I’ve been exposed in New Zealand have already had a deep impact on my musical thinking and will continue to shape my work in valuable ways. I am now immersed in a new and different culture, which has been fascinating to get to know. I feel extremely lucky to have had the opportunity to live with several Kiwis, who are some of the most charming and intelligent people I’ve ever met. This has led to my meeting many interesting, artsy and often worldly people, who typically share my values about the environment and sometimes even my fascination with the natural sounds of this country. Further, they often challenge my sensibilities. My outlook on life has broadened significantly as a result of my time here. And I’m confident that the new perspectives and ways of doing things to which I have been exposed will positively influence my choices for years to come. I feel that I have been lucky to have met such wonderful people here, and I have made friends for life. As my wife has often said, when it comes to the delightful people we’ve met here, we have struck gold. I agree. I am grateful for this wonderful opportunity. What I’m learning and experiencing here will enrich my musical and personal development for years to come. Thank you. Just over three years ago, I landed in Nashville for my Fulbright gateway programme. It was hot, I was jet lagged, and I realized I’d forgotten to pack my toothbrush. A kind gateway volunteer took pity on me and drove me to the nearest pharmacy. We were nearly there, when a siren came on the radio. What’s that, I asked. It’s a tornado warning, she replied, much more casually than I would have expected. We took shelter among the brightly lit aisles of cosmetics at the Walgreens. I grew up in the Hutt. We don’t have tornados there. I had no idea what was happening. That sense of the surreal would stay with me, in one way or another, for the next year and a half. One minute I was interviewing a social worker about prostitutes in the South East Bronx. The next I was shuffling through snow up to my knees after the worst blizzard to hit New York in decades. And then I’d be listening to the guy who gives out the Pulitzer prizes describe how bladder control and oatmeal are the keys to being a successful journalist. 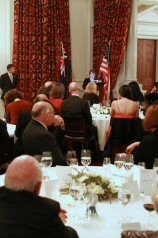 I can’t even begin to summarize the opportunities, experiences and friendships that my Fulbright exchange has given me. I wouldn’t be where I am today, both professionally and personally, without it. The exposure to a different style of journalism, the access to the best in my field, and the friendships forged in computer labs at 2am, have all had their impact. But beyond that – living and studying in another place, especially one that is at once so similar but so different, gives you perspective on yourself and your own culture. A few months ago I was contacted by two of this year’s crop of grantees, for advice about living in the United States. They are brilliant and enthusiastic, and I am in no doubt that one day they will come back and use what they’ve learned to make New Zealand a better place – just as I hope to in the years to come. And that’s why Fulbright needs your support. The donations you’ve made, and the bids you’re all about to make on those fantastic artworks, make such a difference to the lives of young New Zealanders, and to our country as a whole.